Get away to New York City for a weekend of pampering at the spa, romantic dinners at famous restaurants, great museum exhibits and shopping. Here are some of the best packages for couples. Plan a weekend trip to the city to enjoy its attractions, shows, museums and scenic views. NY is a shopper's paradise, home to world-famous stores like Bloomingdale, Saks Fifth Avenue and Barneys. Get away for a quick shopping trip with one of these packages and deals. Be sure to check the terms of the offer because they may have changed since publication. The Ritz-Carlton New York, Battery Park guest rooms feature a telescope that offers spectacular views of Lady Liberty across the waterfront in the Harbor. The hotel is offering the package Discover with You. The package offers deluxe overnight accommodations. 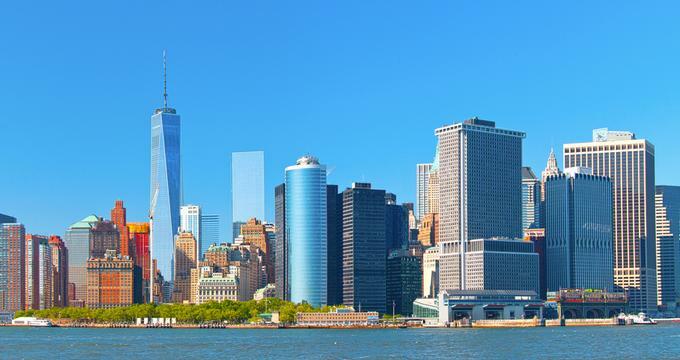 Guests can take advantage of an American breakfast for two every morning and Lower Manhattan cultural attraction passes for two, once per stay. Guests receive $50 hotel credit per night. Rates start from $465 per night based on single or double occupancy, excluding taxes and other charges. The Plaza is a luxury hotel in New York. An iconic hotel, it displays the opulent grandeur of the Beaux-Arts décor and promises exceptional amenities. The hotel is offering the Legacy Suites package. The package includes overnight accommodations in one of the 29 Legacy Suites and top VIP status. Included is complimentary round-trip private airport transfer. Alternatively, guests can opt for valet parking. Guests receive fresh flowers, personal pre-arrival concierge, in residence business cards, and white glove butler service. Rates start from $1,495 per night, exclusive of tax and gratuities. Trump SoHo soars high above the boutique shops, restaurants, and art galleries in lower Manhattan, New York. This luxury hotel offers intimate but dramatic accommodations with 391 rooms across 46-stories. The hotel is offering the Family Value package, which includes a complimentary in-room children's breakfast for kids under thirteen years with the purchase of one adult meal. The package offers a sofa bed or a complimentary rollaway per two-bedroom suite. Children will be excited by the signature Trump Kids amenities. For an additional $250, guests can reserve a spacious two-bedroom suite on the king portion of the suite. The Iroquois New York is a luxury hotel that offers an array of rooms and suites, providing exceptional service, amenities, and modern essentials like Wi-Fi. The hotel is offering the package Suite Escape to NY, which offers savings of 20% to guests. A minimum two-night stay is required. Reserve a select suite for two nights or more and save 20% with the flexible rate and also receive a welcome amenity. Guests can enjoy a leisure continental breakfast every morning with this package. Hotel Plaza Athénée is an elegant hotel in Manhattan, New York that is offering the Body and Soul package. The package includes two fitness breakfasts every morning in the Arabelle Restaurant. Included is a treatment at Valmont Spa. The Peaks of Slimness comes highly recommended as it slims, tones, and erases cellulite. Guests might also choose a signature facial or massage followed by a smoothie created to enhance the treatment. Guests receive two passes to the neighborhood Flywheel, an indoor cycling class. The package is exclusive of taxes, and there is a $250 flat fee per room on the best available rate. Hotel Elysée is an elegant hotel in New York.The hotel is offering the Bloomingdale’s Shopping package, guests can enjoy luxurious accommodations within easy access of Bloomingdale’s shopping experience in midtown Manhattan. The package offers a surprise gift from the Visitor's Lounge at Bloomingdale’s midtown and free frozen yogurt with purchase of an entree at the renowned 40 Carrot's restaurant. Included are savings of 15% off storewide and a $50 gift card. Guests also receive a personal shopper and complimentary delivery of purchases to the hotel. A two-night minimum stay is required. Guests also receive wine and cheese reception evenings, a complimentary continental breakfast, complimentary refreshments, and Wi-Fi. W New York Union Square is a top choice in New York City luxury hotels. They offer an ideal setting for a family vacation, romantic getaway, or a business trip. The package Save 40% on Your 2nd Weekend Night package offers great rewards to guests who choose to stay longer. Guests receive 40% discount on the next weekend night for every weekend night that they pay a regular rate. This offer is valid for stays Thursday-Sunday with a two night minimum stay, and it is not applicable to groups. The Mark Hotel is a luxurious and serene retreat in New York. This grand 1927 property is located in the heart of Manhattan and boasts an elegant ambiance with art deco inspired rooms, a vibrant bar, and gourmet dining options. The Mark Hotel is offering the Suite Car package, which allows guests to experience the joys of this wonderful city. Included in the package are a car and the services of a driver for six consecutive hours each day of stay when guests book a Manhattan one-bedroom suite or a better option. 70 Park Avenue is a Kimpton Hotel located in New York close to the Grand Central Station, Fifth Avenue Shopping, and the Rockefeller Center in New York. A classic hotel, its ambience is bright and colorful. 70 Park Avenue is offering the Train Ticket package. Conveniently located about two blocks from Grand Central Train Station, the hotel provides guests an extra 10% off the best available rate when they show their train ticket during check-in. Rates are based on double occupancy, and taxes and gratuities not included. The St. Regis New York is a legendary hotel overlooking the world famous Fifth Avenue, and it is located in the heart of midtown Manhattan. An original Beaux Art classic landmark, this historic hotel offers luxurious accommodations and modern amenities. St. Regis hotel is offering the Experience Suite Luxury with a Second Night for $4 package. The package celebrates the heritage of this hotel, which first started business in 1904, by offering a second night for only $4 when guests book a suite. A minimum two-night reservation is required, and blackout dates apply. The Pierre is a Taj Hotel overlooking Central Park on Fifth Avenue, New York. The hotel showcases spectacular views of the city and Central Park from its luxurious rooms and suites. Guests will be impressed with the Turkish marble bathrooms and elegant bath amenities. The Pierre is offering the Weekend Rate package, which offers 20% off at the bar, and guests will also receive complimentary Wi-Fi for 3 devices. The package is valid only for Friday, Saturday, or Sunday night and is subject to availability at time of booking. Algonquin Hotel Times Square is a historic New York hotel located in the heart of Midtown Manhattan. They offer elegant accommodations that reflect an antique ambience, but with all the comforts of modern amenities. The hotel is offering the Friends of Matilda package. Matilda is the resident feline of Algonquin Hotel Times Square. The package includes a personalized welcome letter from Matilda and a plush replica of the furry feline. Guests also receive the book Health & Beauty secrets for the Pampered Cat. The Chambers Hotel is a beautiful hotel in Manhattan, New York. Their walls display over 500 works of original art, and the suites and rooms offer luxurious accommodations with modern amenities. Close to Fifth Avenue, Central Park, the theatre district, and the Museum Mile, the hotel is optimally located, allowing guests to enjoy many of the cultural performances and sights that this city has to offer. The hotel is offering the package Life is Art, which offers an opportunity for guests to experience art and culture in the magical world of MoMA. Included is a welcome amenity and two corporate passes to MoMA. Guests also receive a guide book, Revel in New York. The Casablanca Hotel Times Square is a European style boutique hotel in New York. The hotel is offering the Pick your Perk package. Guests will receive the most competitive rate and a complimentary welcome amenity of choice for the next stay. Prepayment is required 14 days before arrival, and the amount is non-refundable. A one-night minimum stay may apply based on availability. The welcome amenity can be selected during the booking, and the package price can be deducted after the booking is made. Guests also receive a complimentary continental breakfast, wine and cheese receptions from 5-8pm, turn down service, access to the health club, and complimentary refreshments in the clubroom. Langham Place, New York, Fifth Avenue is conveniently located close to the shopping areas and the cultural centers of this city. It showcases a chic contemporary style that never fails to impress. The hotel is offering the Complimentary 3rd Night in a Suite package. Guest staying three nights in luxurious suite accommodations will receive the third night as a complimentary stay on the hotel. Included is complimentary internet, a Nespresso coffee maker, and bottled water. Guests also receive access to the fitness center and the hotel's house car for drop off service only. The discount is applied during check-out. Conrad New York is a popular hotel in Lower Manhattan, New York. The hotel is offering the Family Fun package. Included are guaranteed suite accommodations with pullout sleeper sofa. Two children and two adults can enjoy daily continental breakfast, and the package also offers four general admission tickets to the Children's Museum of the Arts and four New York Water Taxi for the Hop On/Hop off all day access passes Enjoy the Ride™ with a guide for the bus and boat tour. Guests also receive complimentary Wi-Fi and self-parking everyday, but without in-and-out privileges. Viceroy Central Park is a legendary hotel in New York. The hotel is offering the Live Like a Local package, which allows guests to explore the beautiful city like a local. Included in the package is a spacious Superior Room. Alternatively, guests can upgrade to a Park View room. Enjoy the beautiful skyline and views of Central Park from the rooftop with cocktails and explore the attractions of the city with the 24-hour Citibike Pass or Metro card. Included is a personal copy of Live like a Local guide. Rates start from $255 per room, per night based on single or double occupancy. This excludes taxes and gratuities. Park Lane Hotel is a luxury 46-storey hotel with breathtaking views of Central Park and the city skyline. A classic ambience and elegant modern amenities make a visit to this hotel an unforgettable stay. They are currently offering the Valet Parking package. Guests can enjoy their holiday with this package, as they will not need to search for a parking spot in busy Manhattan. The package does not include in and out privileges and self-parking is not possible at the hotel. The rate is not valid for groups of ten or more rooms. Lotte New York Palace offers the ideal elegant getaway in New York. The establishment is conveniently located just a couple steps away from family friendly activities, cultural destinations, and the city's most popular attractions. The hotel is offering the Family Values package. Included in the package are overnight accommodations and a 50% discount off the second room of equal or lower value at the time of check in. Guests have access to the stunning 7,000 square foot fitness center that offers spectacular views of the city. This package is available for Thursday through Monday night stays. The Roxy Hotel Tribeca is a classic hotel in Downtown New York that showcases an impressive ambiance and décor. The Weekender package offered by the hotel offers savings on the room rates. Guests receive a complimentary $50 food and beverage tab that can be redeemed at any of the hotel's restaurants. The Roxy Bar & Lounge offers a classic American menu for breakfast, brunch buffet, lunch, and dinner. The Django Bar and Jazz Club is located on the cellar level, while Paul's Cocktail Lounge and Jack's Stir-Brew Coffee are the other dining options.